Even though I didn't like Hannah Montana: The Movie, I still like little kids movies because they are so cute! Hotel For Dogs (2009) is very cute. Probably because I like dogs a lot, and I saw a dog just like mine. A cute little Pomeranian. But my one is cuter. Anyway, Emma Roberts has been one of those actresses who I've waited for to fire. She didn't fire in Wildchild, but it looks like I found a spark in this movie. She is set for a good career, and hopefully this is the last kiddie movie we see her in. Emma plays Andi, a sixteen year old sister of Bruce (Jake T. Austin). Their parents died when they were younger, and now live with a crazy rocker (Lisa Kudrow, a bit freaky and old-looking). 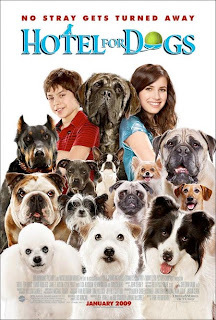 They secretly own a dog, and when he runs away, they discover an abandoned hotel building, where they find two more dogs. With the help of a few friends, they start a hotel for dogs, with cool contraptions and gadgets to entertain the dogs. But they run into trouble...of course. It was lovable, but unfortunately it was missing a few things, like a good script. I know that kids will enjoy it, though I did feel that teenagers could probably relate a bit more to it. Now I wish that I could have lots of dogs, and put them in a hotel.